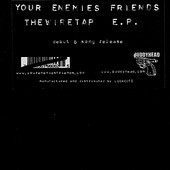 In Music We Trust - Your Enemies Friends: The Wiretap E.P. Trading off between female and male lead vocals, Los Angeles' Your Enemies Friends transform new wave into punk and vice versa. The result is their debut, The Wiretap E.P., a ferocious, hard-hitting slab of fiery, hot-to-the-touch songs that rip through you without a second thought. The songs are powerful and loud, the buzzing of the guitars overpowering you while the rhythm section bruises, the vocals screaming and yelling, sending chills down your spine. I'll give this a B.